DEDHAM, MASS. – Bidders were looking past late January as Caddigan Auctioneers hosted its winter estate auction on January 21 at the Holiday Inn. “We had a John Leslie Breck oil on canvas, ‘Spring Landscape,’ sell for $51,750,” said Joan Caddigan. 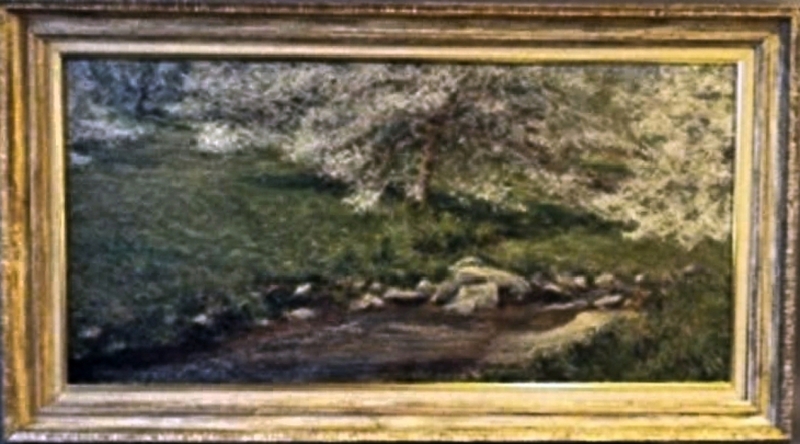 The 18-by-36-inch painting by the Massachusetts artist (1859-1899) depicts a running brook among early flowering trees. Despite his short life, Breck painted a number of notable works, and is credited with introducing Impressionism to the United States with a show in Boston in 1890. For information, 781-826-8648 or www.caddiganauctioneers.com. CRANSTON, R.I. – An antique Persian Bidjar palace-size room carpet, offered among a selection of antique rugs in Bruneau & Co. Auctioneers’ January 26 estate antiques and fine art auction was the top earner of the day when it sold for $12,500. 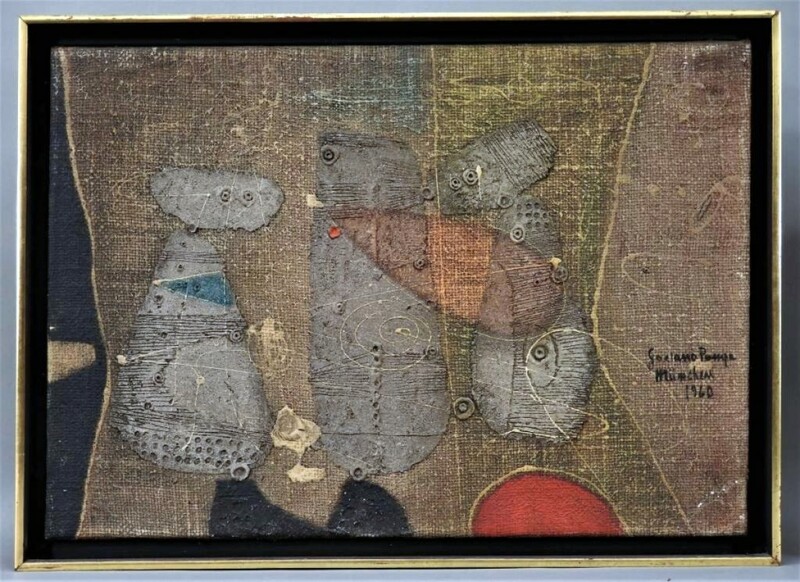 However, the sale also featured a sleeper lot in the form of Gaetano Pompa’s Modernist abstract oil on canvas painting (pictured). Estimated $500/800, the work rose to $6,250. For information, www.bruneauandco.com or 401-533-9980. NEW YORK CITY – The only complete archive of Supreme skate decks in private hands sold for $800,000 on January 25 at Sotheby’s. Diligently and passionately assembled over decades by collector Ryan Fuller, the archive comprises all 248 decks produced by the streetwear brand over 20 years from 1998 to 2018. The archive features collaborations with a number of contemporary artists and artist estates, including two sets featuring Damien Hirst’s iconic “spot” and “spin” techniques, both produced in 2009; a set of three decks in collaboration with Rammellzee; a set of three decks based on Jeff Koons’ “Monkey Train”; and a set of three decks featuring George Condo’s signature portraiture. The archive was acquired by Carson Guo. Born in Vancouver, Canada, in a family of collectors, Guo’s collection includes paintings by Pablo Picasso and Claude Monet. Guo plans to display the collection in his new creative shop, opening in Vancouver in 2020. For information, 212-606-7000 or www.sothebys.com. PARIS – The live auction of the wardrobe of Catherine Deneuve designed by Yves Saint Laurent achieved a total of $1,025,581 and sell-through rates of 100 percent at Christie’s on January 24. The interest in the sale was so immense that 90 percent of all 129 lots sold multiple times above their estimates. The auction lasted five hours, witnessing fierce competition from around the globe. Each piece of haute couture or Rive Gauche clothing was a testament to the 40-year-long friendship between France’s most iconic actress and one of the world’s most renowned couturier. 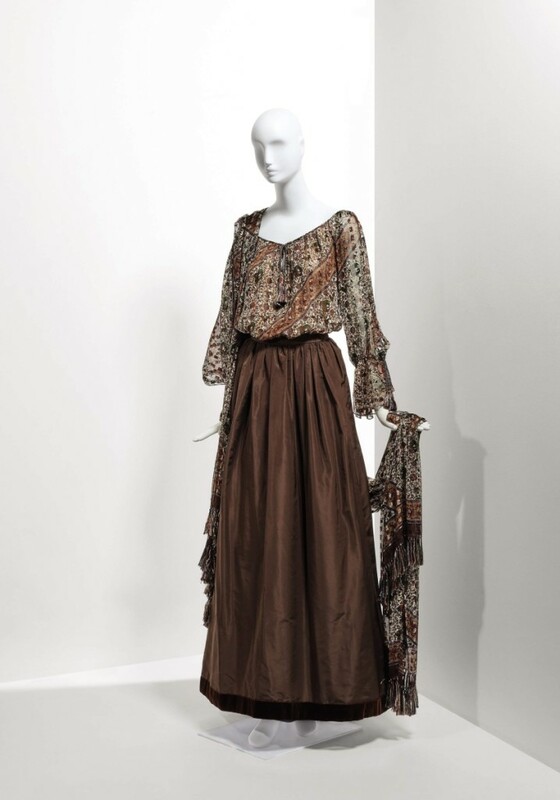 The top lot was the haute couture evening ensemble of the Russian Collection, which Saint Laurent designed for the fall/winter collection of 1977-78. Shown here is an evening ensemble of chiffon blouse, scarf and taffetas skirt. Selling at $60,000, it surpassed its high estimate by ten times. For more information, +33 1 40 76 85 85 or www.christies.com. LOS ANGELES – A custom La Cornue Grand Palais Château Series eight-burner range with side cabinets offered at Andrew Jones Auctions on January 20 burned through its estimate ($4/6,000) to sell for $26,000. The stove had been consigned by a private client from Beverly Hills, Calif., who had removed it from their home and placed it in storage before deciding to sell it. It was chased by several buyers online and in the room and ultimately sold to an online bidder. For information, 213-748-8008 or www.andrewjonesauctions.com. 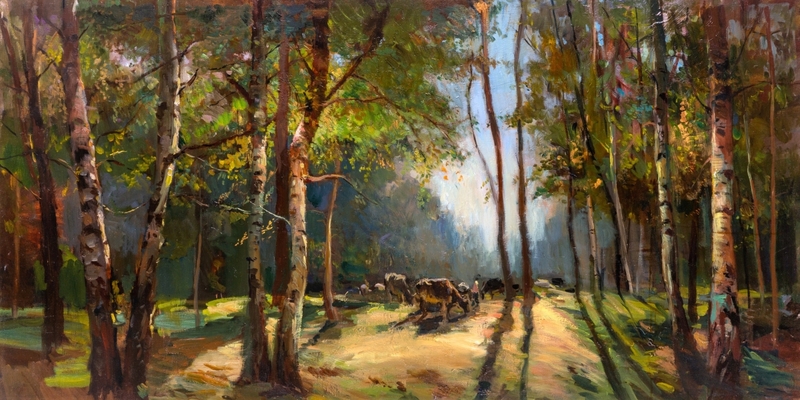 NEW YORK CITY – While not the top lot at Shapiro Auctions’ January 26 sale, a landscape titled “Early Morning” by Russian artist Dmitry Arkadievich Nalbandian (1906-1993) sold for $50,000 to a phone bidder from Russia and underbid by another Russian phone bidder. When asked after the sale why the work, which had been estimated $8/12,000, performed so well, company president Gene Shapiro said, “It had a label on the back from the USSR Arts Export Salon, indicating that the painting came directly from the studio of the artist, and another label from Gekkoso Gallery in Tokyo, which was exhibiting artworks by Soviet Socialist Realists well before the fall of the Soviet Union, as far back as 1970. The director of the gallery, Yoko Nakamura, was visiting the Soviet Union and buying the best works by leading artists of the day to export and exhibit in Japan. Nowadays, when these paintings are being bought back by wealthy Russian collectors, paintings with Gekkoso labels carry with them that positive association with quality. There has been a renewed interest in Socialist Realist works by the leading Academicians of the day. This may be because of the recent 100-year anniversary of the Russian Revolution, an increased patriotism in Russia and a limited supply of paintings by these artists on the international market.” For information, 212-717-7500 or www.shapiroauctions.com. 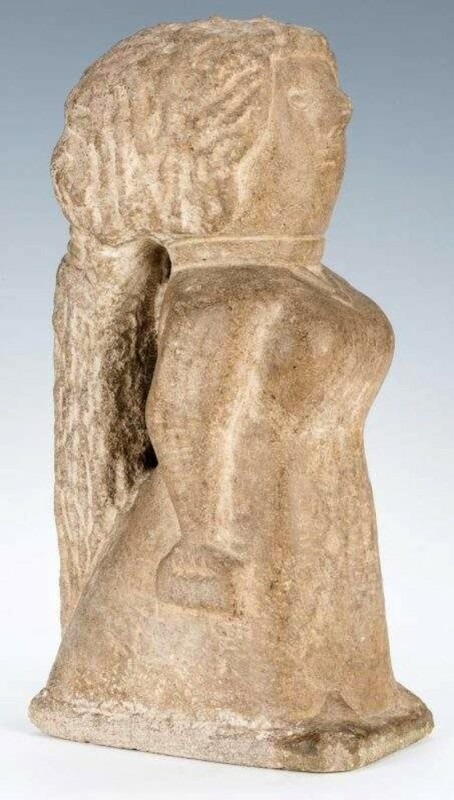 KNOXVILLE, TENN. – A limestone statue of a woman carrying her Bible and purse and carved by renowned African American artist William Edmondson sold for $324,000 at Case Antiques on January 26. The 15½-inch “Miss Lucy, An Uplifted Lady” went to a private collector. It’s thought to be the highest price paid at auction for a female figure carved by Edmondson, the Nashville son of former slaves and the first African American to have a solo exhibit at New York’s Museum of Modern Art. Edmondson, who died in 1951, was a railroad worker, hospital janitor and laborer before he began carving. He was 57 when a spiritual experience caused him to begin sculpting discarded pieces of limestone using a chisel made of a railroad spike. Edmondson said that he heard a heavenly voice telling him to carve; his sculptures often included angels, preachers and figures from the Bible. For information, 865-558-3033 or www.caseantiques.com. BOSTON – On Friday, January 25, Skinner hosted a two-part auction comprising American and European prints, multiples and photographs and American and European works of art featuring paintings and sculpture. The auctions showcased a selection of paintings, sculptures, prints, photographs and works on paper ranging from Old Master through Modern and contemporary offerings. 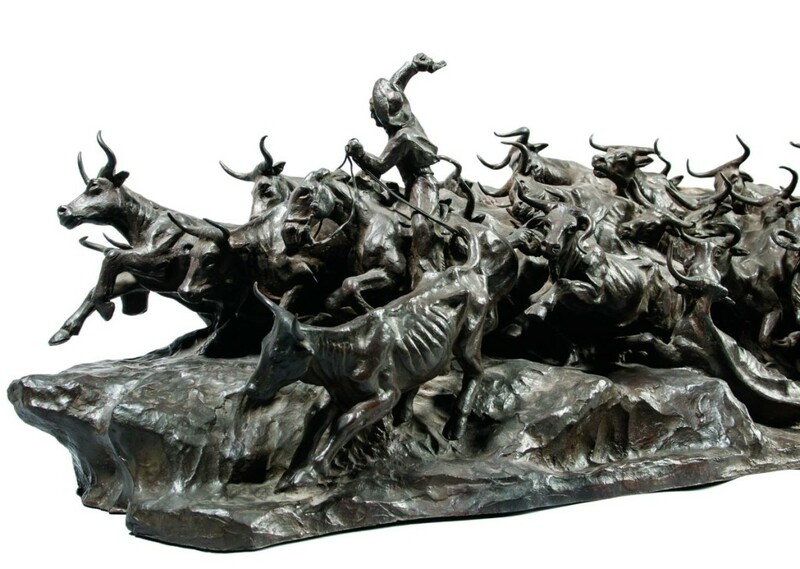 Top lot in the sale came from a selection of western bronze sculptures by Harry Jackson (American, 1924-2011), including an early work “Stampede” (pictured), which sold for $110,700. The sale also recorded $70,725 for an Alexander Calder (American, 1898-1976) untitled gouache. For information, 508-970-3240 or www.skinnerinc.com. Colt’s 1875 Gatling Gun Shoots To Triple Its Low Estimate At Nye & Co.
BLOOMFIELD, N.J. – A Colt’s Mfg. Co Gatling gun sold for $93,750 at Nye & Co.’s January 23 Collector’s Passion auction. The 1875 gun, approximately 5 feet high and deep by 7 feet wide, is inscribed 1875, 45C, and NJ in different locations, serial number 123. It came to the block with a $30/50,000 estimate; its provenance is from Stoneage Antiques, Milt Stone. It was the property from the Westervelt Company, Tuscaloosa, Ala. For information, 973-984-6900 or www.nyeandcompany.com.